Rolex Submariner No-Date – A few weeks back I spoke about getting my new purchase resized at WF&Co., this is it. 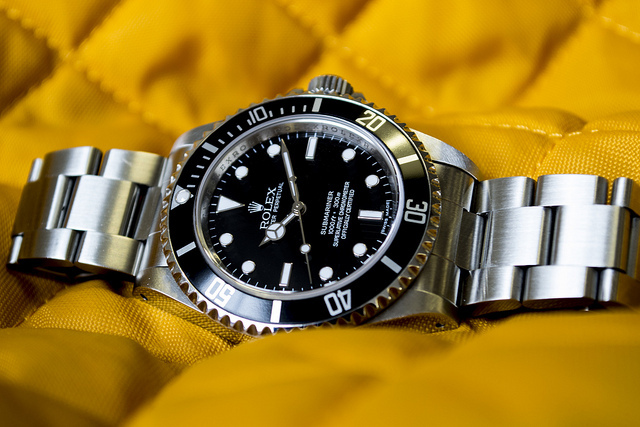 The Rolex Sub No-date 14060M. Some may argue it’s not that great, it’s a very common watch and that its been massively reproduced in the underworld of replica watches! You may well be correct but that fact cements its iconic status and world-wide popularity, something that isn’t easy to come by. I have a bit of a thing with symmetry, hence the no-date. I could have gone for a 16610 with a date window but I’m just not a fan of the cyclops. I looked at the all new 114060 and even came close to getting it, though in my opinion the 20mm Oyster bracelet doesn’t go well with the newly styled square lugs. I do love the new Rolex bracelets, however this was a sacrifice I was willing to make in the pursuit of the svelte 14060M. This Submariner 14060M uses Rolex’s very reliable 3130 movement featuring a power reserve of 48 hours. At 40mm, it feels just right on my wrist. This now defunct model of Oyster bracelet may be a little rattly but it’s very comfortable and secure. It features an extension system, which allows you to wear the watch over a diving suit (something I won’t be doing any time soon but if I do happen to have a Jacques Cousteau moment, then I’m covered). For everyday use you may want to switch it over to a leather or Nato/G10 strap. Rolex Submariner No-Date 14060M can easily be found online via secondhand watch dealers for approx £3700 or £4500 if you go for the COSC version. I purchased mine from WF&Co. Their new boutique can be found at the Royal Exchange (Bank) London.